Ah, James Stewart: the innocent, lovable screwball we all know and love. He’s the admirable, passionate, naive young Jefferson Smith in Mr. Smith Goes to Washington (1939). He’s the dedicated family man and pillar of the community as George Bailey in It’s A Wonderful Life (1946). He’s charming. He’s sweet. He’s good ole aw-shucks Jimmy Stewart. But Stewart turns his characteristic sweet naivety on its head as Gaylord Esterbrook in 1940’s No Time for Comedy, recently released on MOD (manufactured-on-demand) DVD from Warner Archive. In this film, Stewart’s Esterbrook is a comedic playwright from Minnesota. Although the film begins with Stewart embodying his signature persona–a small-town, naive, innocent young man–he soon morphs into a man ruled by his ego. 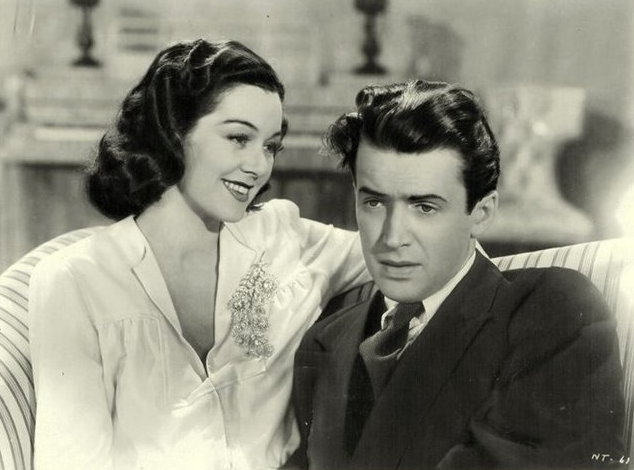 In contrast, Gay’s wife, Linda (Rosalind Russell), begins the film as a strong-willed, intelligent woman, but by the end of the movie, she bends to her husband’s wishes to become more “supportive” (i.e. submissive). This story as a whole is a social satire that is, for the most part, lacking in comedy. Although the film begins with a cute illustration of how their marriage began, its charm ends abruptly as Gay begins spending time with a married woman known for her interest in acquiring men of budding artistic talent. The woman, Amanda Swift (Genevieve Tobin), convinces Gay that he should write tragedy instead of comedy. Gay secretly spends an enormous amount of time with Amanda, his “inspiration.” After Linda learns of Gay’s relationship with Amanda and confronts them both, Gay declares that he is leaving her in order to marry the patroness. Once Gay’s tragedy becomes a flop, however, Amanda is quick to leave him. Linda stands by him, and the two reconcile. Although quite a popular Broadway hit, critics have called this film adaptation “dull” and “predictable.” Indeed, the usually charming James Stewart played a truly contemptible character, which may have forever altered my enjoyment of seeing him on the screen. The Broadway production starred Laurence Olivier as Gaylord, and I honestly can’t imagine what that would have been like to watch. It is said that Olivier’s part in the Broadway production caused Vivien Leigh much distress while she was filming Gone with the Wind (1939), as the time and distance proved to be extremely difficult for her. Although I personally did not find this film to be entertaining, I can understand how, during the era of the Great Depression when so many were downtrodden, an audience would enjoy escaping their problems and gawking at the petty problems and loose morality of the upper class. 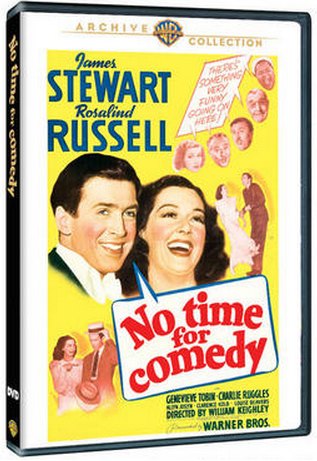 True Classics thanks Warner Archive for providing a copy of No Time for Comedy for the purposes of this review.